Lets you choose your starting spells. Includes an option in game to start with no spells. Big Update on the Way! but I am working on it. Stay tuned. First, it edits the Player Actor so that you do not start the game knowing Flames and Healing. (This is the only way to remove those spells, normal script and console commands will not work.) If any other mods also edit the Player Actor they will clash with this one. Let me know if you find one that does and I will look into making a patch. Second, it gives you a Power called Spell Choice. This power uses the Voice slot. Once you start a new game, simply equip the Power from the Magic Screen and activate it (The Z Key). This will display a series of Menus allowing you to choose your starting Spells. At most you can have 5 spells, 1 per school. You can choose to not know any Spells of a certain school. There is also an option to Start with No Spells, which skips the rest of the menus. 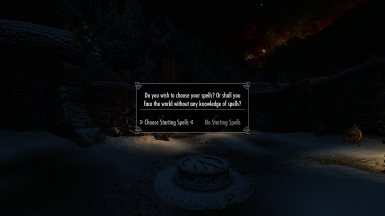 I was inspired by Starting Spell Choice by AliTheLord, but this mod and its scripts are entirely my own work. -Allows you to choose from 2-3 spells per Magic School. -Allows you to choose from 5-7 spells per Magic School. Full and Extended Versions - Opening these in the CK sometimes removes the dependencies on the spell package mods.if you choose a Spell from one of the spell package mods and you do not learn it, it might be caused by this. This mod should be compatible with most mods. The only thing it edits from the base game is the Player Actor. For mods that already include a similar feature (for example Disparity), the Basic Version of my mod will be redundant. However, if you are running the Full or Extended versions, it should be possible to overwrite the Spell selection from those mods with my mod. Simply complete the character creation from those mods, and then afterwords use the Spell Choice Power from my mod. 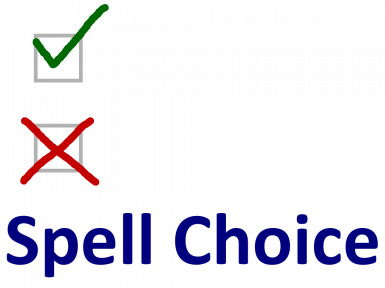 This should erase the spells choosen from character creation and allow you to choose fresh spells (including the ones from the supported Spell Package Mods. This SHOULD work without issue, HOWEVER I have not tested it as of yet. You may wonder why I chose Apocalypse and Lost Grimoire for the Full Version. Apocalypse is pretty obvious: it is the most endorsed spell package on the Nexus. Also it makes its spells feel like they belong in the game. Lost Grimoire achieves a similar feel. And there is little overlap of spell effects between the two mods. I chose to add Elemental Destruction Magic to the Extended Version because it added more variety to Destruction in a new (but still lore friendly) way. I might add a new Spell mod to the Extended version. For the time being I think the Full version is pretty solid. I only plan on having a few versions of this mod to manage. So having a different version for every Spell Package or combinations of Spell packages is a no go. For me to even consider a Spell package it needs to be super lore friendly and fit in with the vanilla game. This is not to say anything bad against these mods or their authors. I am simply not supporting them with this mod.. Mostly they don't fit into the pre-existing Skyrim Magic system. This is my personal opinion. I am not saying you can't run them. 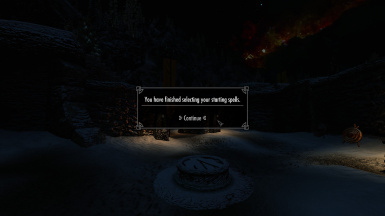 Simply that you can't start with Spells from those mods using this mod. If you have a favorite Spell Package that is not on the above list and you think would fit in with the Spell Packages already included in the Extended Version, feel free to suggest it in the comments. I will take suggestions into consideration. I am not here to say one mod is better than the other, just explaining my decision making process in developing this mod. I am considering adding extra messages that would give descriptions to each Spell before you Chose it. You are at the Destruction Menu, you click on Sparks. Sparks is added to your Spells and you are moved to the Illusion Menu. You are moved to a new menu describing Sparks with a Choose option and a Back Option. 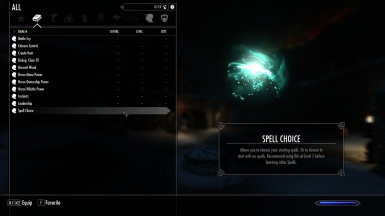 If you select Choose: Sparks is added to your Spells and you are moved to the Illusion Menu. If you select Back: you return to the Destruction Menu. Is this something you would like to see added to the mod? Please let me know your thoughts in the comments section. I hope to fine tune this mod and am looking to get some community feedback. If you have any questions please ask in the comments section. I try to check it at least once a week.